Noise issues can be attributed to a variety of interior and exterior sources, including guest activity (e.g. talking, arguing, or partying), electronics or appliances (e.g. televisions, alarm clocks, or HVAC systems), hallway sounds (e.g. ice machines, elevators, or slamming doors), and the building’s surrounding environment (e.g. if the property is located beneath an air route, adjacent to a freeway, or near a nightclub). For hotels, the financial impact of a noise problem can be substantial. Following an unpleasant stay, dissatisfied guests are less likely to return to a property and more inclined to post a negative review online. As a result, the hotel’s reputation and bookings can suffer. A TripAdvisor survey found 55 per cent of people booking hotel rooms specifically read online reviews mentioning sleep quality before making a reservation. There are also direct costs associated with appeasing unhappy visitors, such as offering discounts and vouchers. Noise problems persist within these facilities for two reasons. 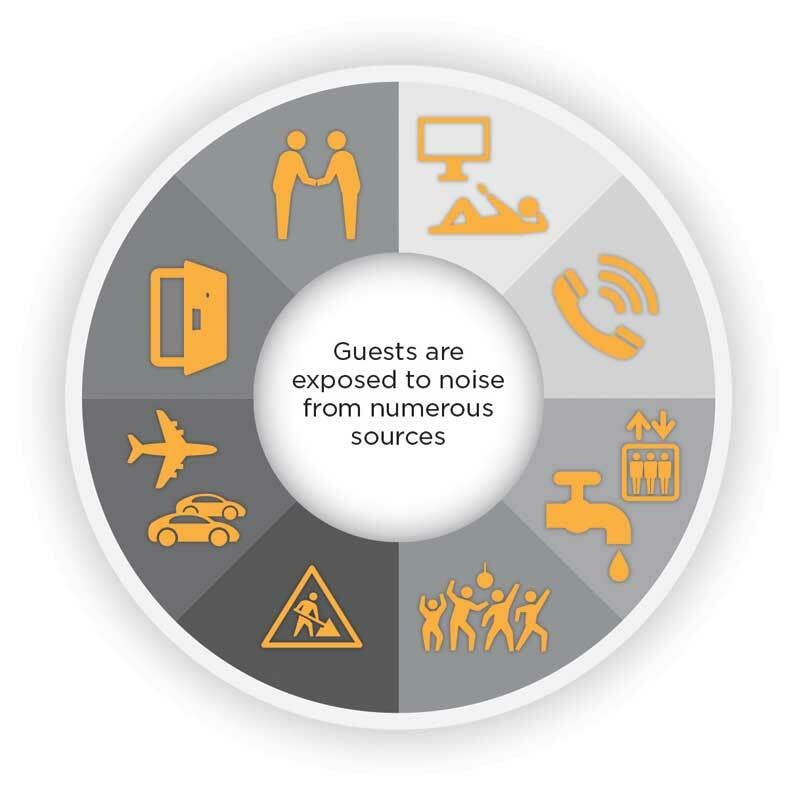 First, as demonstrated by the JD Power North American Hotel Guest Satisfaction Survey, the majority of guests do not complain to hotel staff when disturbed by noise. Instead, they simply decide not to return to the property, leaving many hotels unaware of the problem and its impact. Second, when aware of this issue, the majority of hotel managers attempt to address it in pursuit of an unachievable goal: silence. As illustrated above, noise issues can be attributed to a variety of interior and exterior sources. To block exterior noise and prevent interior transmission, property managers may increase construction standards for walls, windows, floors, and doors, or simply attempt to quiet noise sources from within the rooms. (Low background sound levels can place limitations on a hotel’s procurement options when sourcing equipment meant for guest rooms. In a 2005 article in Hotel & Motel Management magazine, Mark Holzberg, president of minibar maker Bartech Systems, noted the background noise level in guest rooms is around 31 dBA. As a result, his company needed to engineer exceedingly quiet equipment to avoid guest complaints.) Although these methods are a necessary part of an effective acoustical plan, it is impossible to completely eliminate all noises. (Some hotel operators have tried implementing policies to keep guests with lower noise tolerance away from any noisier areas/guests [e.g. providing business-only or family-friendly floors], while others have implemented quiet hours or offered guests earplugs. However, guests should not have to bear the burden of poor acoustical planning.) Further, the lower the room’s background sound level becomes as a result of these initiatives, the easier it is to hear any remaining noises—even those at low volume.